Need some direction in your life vocation, life work? Here is a nice video to wake up to on a Friday, the day before the day many people retreat to their “real lives.” Alan Watts asks the right questions that get you to examine your motives and your desires. What if money was no object? What do you desire? For more of Alan’s juicy insights check out his website or visit Youtube for an array of other philosophical and inspirational clips. When was the last time you sat around a campfire, taking turns, telling or listening to stories? Do you miss that sharing? Is it lost to you, or can you open your heart and find that like an ember, that story and many stories are sitting inside you, ready to be lit afire? 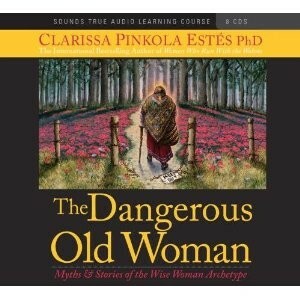 This weekend my name finally made it to the top of the list at the library for the CD set, “The Dangerous Old Woman: Myths & Stories of the Wise Woman Archetype” by Dr. Clarissa Pinkola Estés. I first learned of Dr. Estés through her book, Women Who Run With the Wolves, but I especially enjoy the storytelling on her CD set. If you have any curiosity about the wise woman archetype or simply love stories, I strongly urge you to look into this series. Listening to her work is like being reintroduced to stories around a campfire. So powerful and so rich. She begins with the fairy tale of Snow White and then goes into depth about its meaning and significance. I won’t spoil the details of her insight and would if I tried, but I will say, what a talented storyteller she is! I became so enchanted and lost in story, that when I awoke from her trance I realized I hadn’t experienced such a feeling in a long time. I remembered how powerful it is to hear story rather than to simply read it or write it. I also recognized how lessons and learnings seem to gel so much better in my brain and in my heart when I hear information tied to a story. Which got me thinking, why as adults don’t we read fables to one another? Or maybe we exchange stories in a different way, for example, through a TV series or a Youtube video or a 140 character tweet. Regardless of delivery or content, what are the stories we tell ourselves and our children nowadays? What are the modern day fairy tales circulating out there? How has storytelling been cheapened or beautified by the process of globalization? And what is the value of storytelling? Does it still have value? What is it’s purpose? Can stories still offer us life lessons? Can we use stories to motivate others? Well I am not coming on here to dole out answers nor do I have them all, but I can say with certainty that I need stories to understand, experience and connect to my surroundings, community and myself. Stories are invaluable to me, and yet I do not always praise and honor them. With the fast pace of life I do not often allow myself to tell my story, the kind that comes from deep within my heart. And then it occurs to me, so many of us have buried our stories so deep within us. And, then, because on a daily basis we operate from our minds alone, we lose touch with the heart of our story lines – cutting ourselves off from so many things like our cultural past/present, our highest self and our very life purpose. Even though some days it may seem like the story is dead within us and the people around us, if we shift our perspective we can see that stories are still alive and thriving and impacting the very way we experience the world. They are not dead but simply need to be rediscovered, nurtured and ultimately transformed in a way that can be shared with others. For those of you who have taken the time to discover and heal and are now ready for the sharing part, you may feel like you have a story stirring in you, ready to come out to the world. So, how are you going to tell it? Is there a right or wrong way? It depends on your goals. If you want to tell a story to motivate or influence someone, there are some methods to consider. Infuse your story with a little bit of strategy and you can turn your tale into something bigger that may move others into action or that may move someone to share their own story. When we are all sharing our stories, we begin to be with ourselves and with one another in a way that offers true healing, learning and connection. Prevention Speaks is a storytelling resource for healthy change in communities that is local (from Wisconsin). This website has a lot of great links and there you can pick up your very own storytelling tool kit. Right before Thanksgiving, I had the opportunity to check out the documentary, Somewhere Between. I really had no expectations, other than to maybe be enlightened by a film filled with insightful commentary about international/transracial adoption. Being a person that was adopted from Korea, I have self-interest in this topic but was most drawn to this comment about the film: “These four wise-beyond-their-years, yet typical American teens, reveal a heartbreaking sense of self-awareness as they attempt to answer the uniquely human question, ‘Who am I?‘” When I saw that description I thought it fit well with my own personal journey and Mandala Reflections – where individual stories overlap and become one with the whole. Well what came from the movie showing was less informative and more thought-provoking for me. Just what I needed at that time. (Hint of sarcasm? Maybe not). If you enjoy raw stories and real people, maybe who are different from you, or maybe not so different, then I highly recommend this movie to help you think outside the box – and to maybe stir up your thoughts about what it means to be part of a family and how your being and connection/disconnection to your family may impact your world. I won’t say too much more other than my biggest takeaway from the movie is how family, community, and culture interplay and create and recreate the people we are today. That’s powerful stuff, if you ask me. And it just might make you cry for better or for worse. For a teaser, check out the trailer below. Otherwise check here for a showing near you.